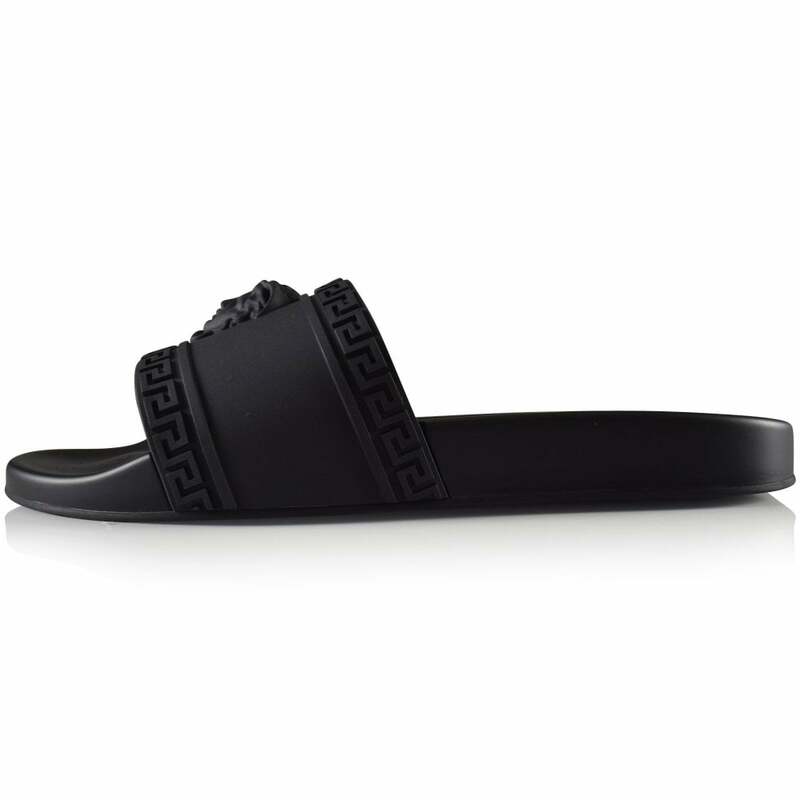 Versace. There is no brand like it. It is synonymous with decadence, opulence and the highest of high fashion. A firm favourite of A-List celebrities, Versace has dominated the fashion landscape for four decades. It’s unsurprising given how many insanely famous close friends Gianni Versace had. He was one of the first designers to recognise the potential power and influence the music industry could have over fashion, brand growth and brand recognition. Madonna, Elton John, Tupac and Cher are just some of the huge names who helped bring Versace to the fashion forefront. Perhaps just as recognisable as the brand name, the Versace logo features Medusa, harkening to Versace’s childhood in Rome. It’s said that the inspiration behind using Medusa as the brand’s figurehead came from Versace’s childhood, where he used to play among Roman ruins emblazoned with ancient Greek artwork. The use of Medusa is delightfully ironic; cursed for her vanity, Medusa turns anyone who meets her gaze to stone. It’s not known whether Versace was aware of this when he chose the image as the logo, nevertheless, it is a striking and unique logo that has no doubt aided Versace’s meteoric rise. So, in the spirit of celebrating all things Versace, we’ve picked out six of our favourite pieces so that you too can experience the luxury, opulence and decadence that is Versace. Given that nearly all of us carry a digital clock in our pockets in the form of a smartphone, buying a watch is no longer about being able to tell the time when you’re out and about. A watch is a statement piece, and boy does this make a statement. Crafted in chrome with a beautiful bronze and grey colour scheme, this watch features a Swiss-made Ronda Z50 Chrono quartz movement. And who would expect less than the best from Versace? 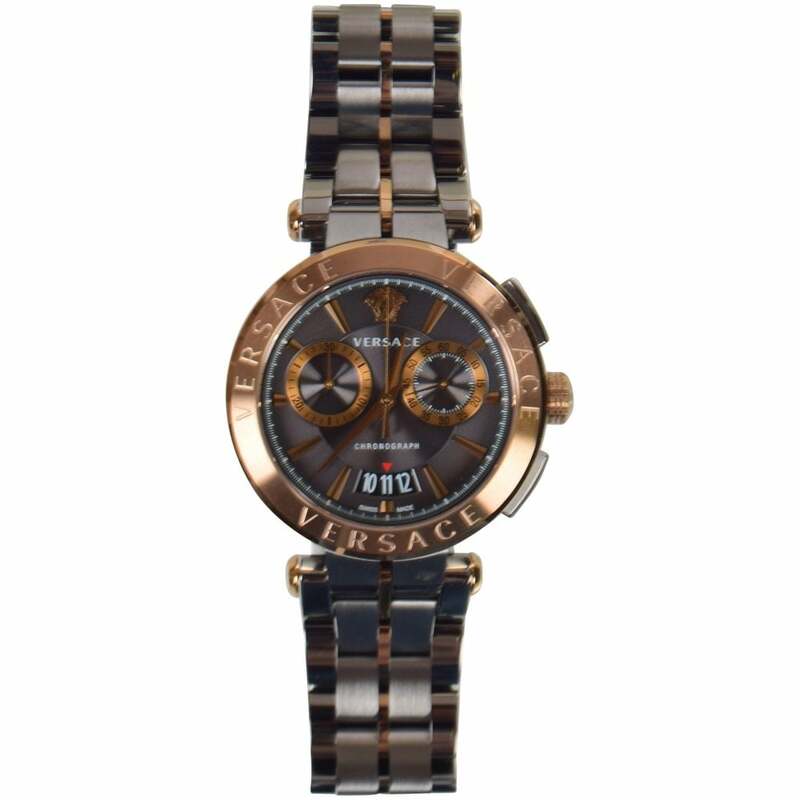 Completing the watch are the Medusa logo and Versace branding at 12 and 6 o clock. A stunning addition to any enthusiasts collection, this watch is a must-own. And if you’re not usually a watch person, but you’re looking for a statement piece to wow anyone you meet, well, look no further! The famous Versace hibiscus print is instantly recognisable to those with their finger on the fashion pulse. This lightweight hoodie is perfect with Spring on the way. It can be hard to marry high fashion and comfort, but this hoodie achieves just that. 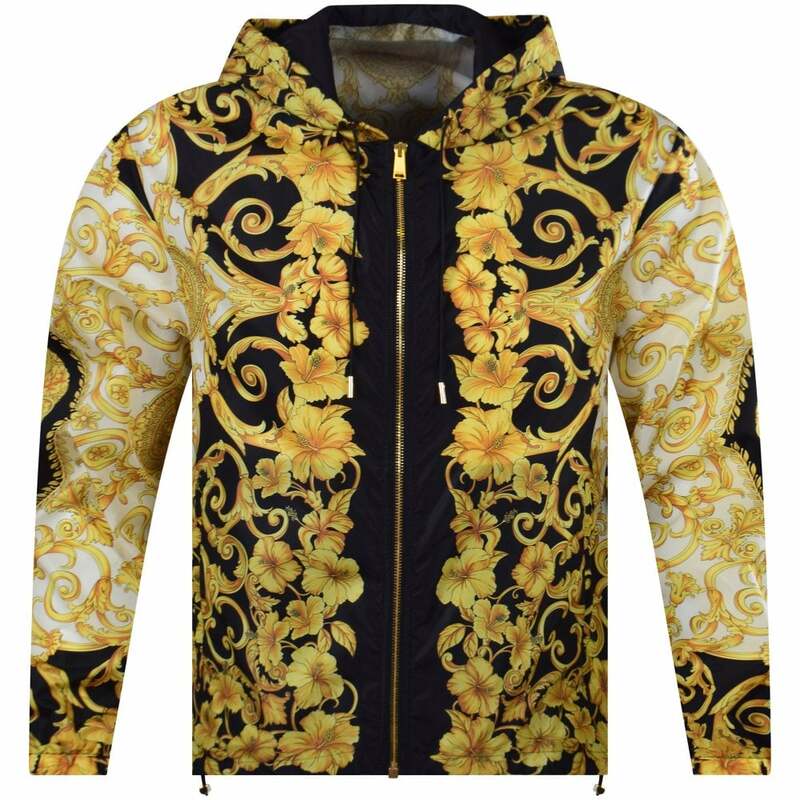 The bold golden design creates a stunning contrast with the black background and, just in case anyone was in any doubt, the Versace logo is emblazoned across the back in bright white. If you love to keep your look fresh and fashion-forward but also value comfort and warmth, this is the hoodie for you. For those slightly cooler days, this pullover hoodie is perfect. The gold hibiscus print is back, mixed in with the Medusa logo to create an eye-popping design. 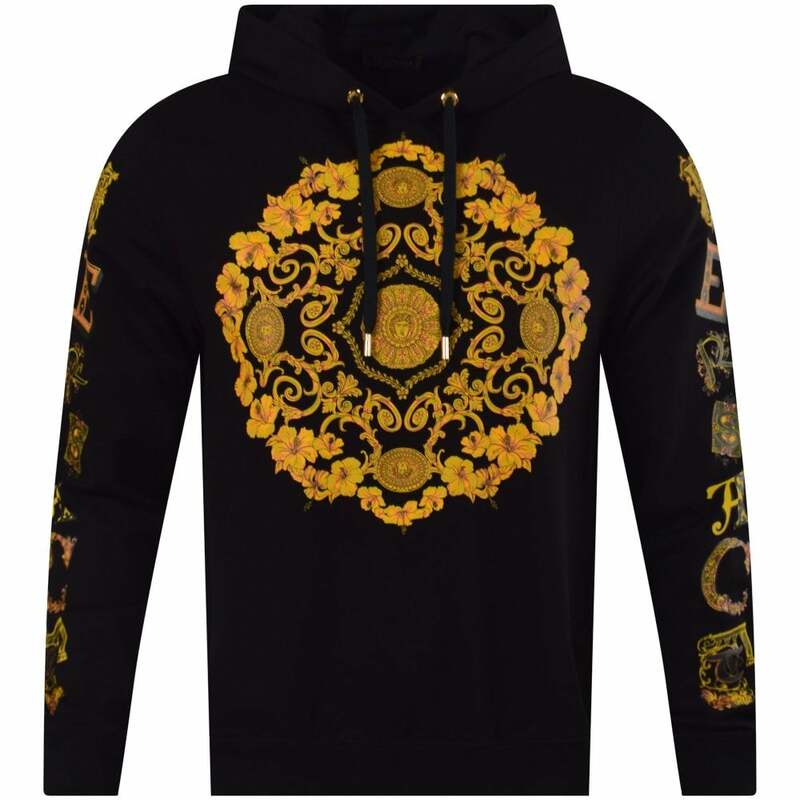 Crafted from luxury cotton, this hoodie features Versace branding running down both sleeves, with each letter exquisitely designed so that it is different from the one before. We can’t always be lucky enough to have a long hot summer, so keep this hoodie handy for when the temperature drops. Speaking of long hot summers, it’s definitely time to start the search for your summer sunglasses. We may have made the search extremely easy for you as we’re sure not many people would be able to resist snapping these beauties up. These glasses feature round blue/black lenses fit into a black and gold frame. 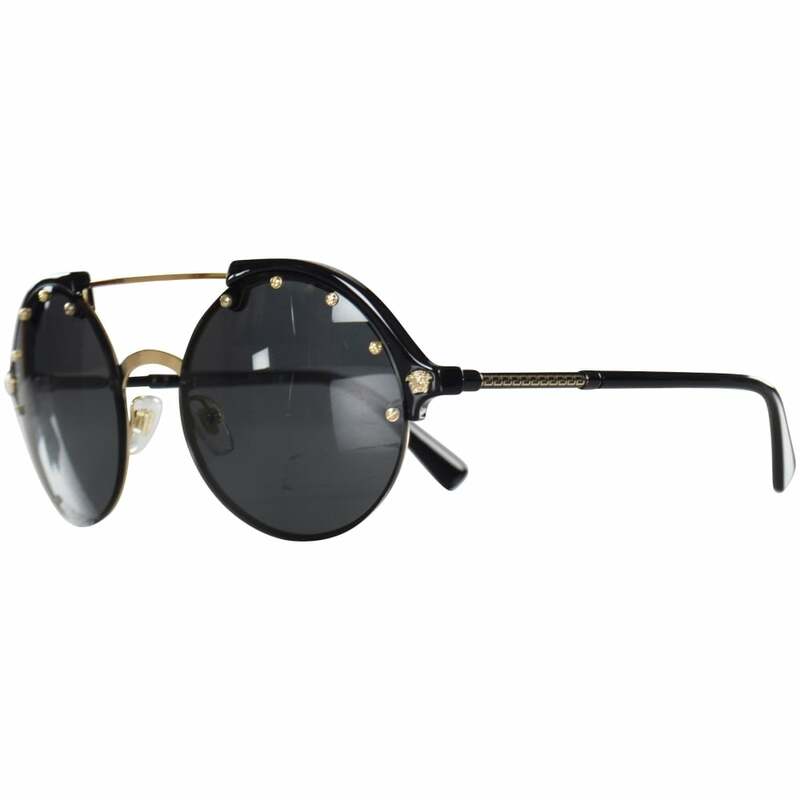 It’s Versace, so there has to be some gold in there somewhere, and further gold accents have been added to the lenses themselves in the form of gold studs, completed in intricate detail with the Medusa logo. Protection for your eyes while keeping your look on point? Absolute winner. With such a stellar reputation, you could be forgiven for thinking that Versace has been around forever. And that’s the impression you get from this T-Shirt. 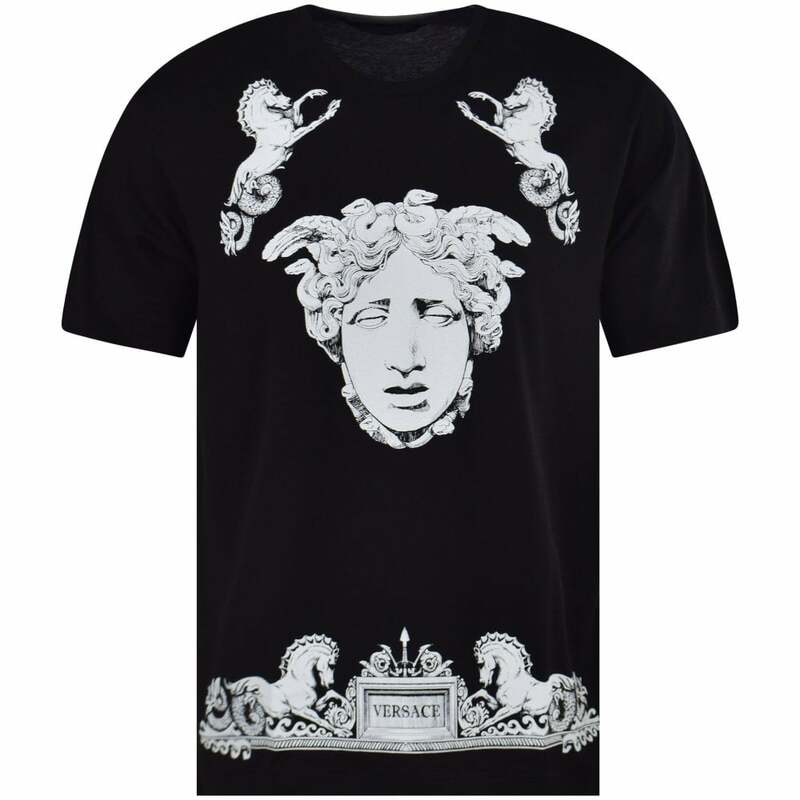 Made from black cotton, the shirt is emblazoned with Ancient Greek designs that look like they’re made from stone, including Medusa across the chest and an ornate design running along the bottom of the shirt that looks like it’s been ripped off the top of an ancient Greek ruin, complete with Versace ‘carved’ into a stone plate in the middle. Beautiful ancient architecture combined with high fashion – what more could you want? And with Spring around the corner, this short-sleeved shirt will be perfect to welcome the warmer weather. If you’re chilling by the pool on your summer holiday, you could easily slip on some cheap flip-flops to protect your feet when you fancy a beer. But why settle for less? Featuring the famous Medusa logo, these sliders are a must-have for beach days and summer nights. Snap them up now and be smug in the knowledge that come summertime, even your casual footwear is as stylish as can be.